You give us a person that doesn't love Jamie Foxx and we'll call them a liar. 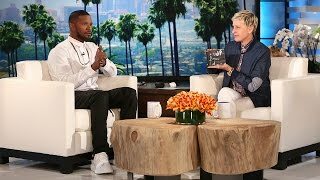 Jamie made an appearance on Ellen DeGeneres' chat show in the US this week and told some seriously interesting stories about his journey towards becoming a successful musician. From getting shunned by Teddy Riley (once you watch the video you can kind of see why) to discovering that the random guy rocking up at one of his house parties with a rucksack happened to be one Kanye West, it's a story not to be missed. Earlier this week Jamie unveiled a brand new song from his upcoming studio album. The song, a collaboration with Kid Ink, is called 'Baby's In Love,' and is available to stream now. Watch Jamie tell the brilliant story above.